Are you interested in a career in health care? If so, have you considered becoming a medical laboratory technician (MLT)? MLTs are laboratory’s generalists who work under the supervision of pathologists or laboratory technologists/scientists. Why Should I Consider Becoming a Medical Laboratory Technician? The Bureau of Labor Statistics projects that the employment of medical laboratory technicians and scientists will increase by 16% through the year 2024. According to the American Society for Clinical Pathology (ASCP), clinical scientists accounted for 335,700 jobs in 2016, and about half of these jobs were in hospitals. Other workplaces for MLTs include clinics, doctor’s offices, blood banks, government agencies (i.e. 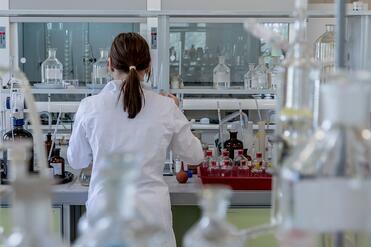 public health service) and independent clinical, forensic, and research laboratories. How In-Demand Are Medical Laboratory Technicians? There's currently a documented shortage of working laboratory professionals in the U.S. According to the latest bi-annual survey performed by the ASCP, laboratory professions are seeing a range of vacancy rates from about 5% for anatomic pathology departments to roughly 9% for chemistry departments. What's the Salary for Medical Laboratory Technicians? In 2015, the median salary for MLTs was about $41,420 and $60,520 annually for medical laboratory scientists (based on geographic location). What Shifts Do Medical Laboratory Technicians Work? Since hospitals are open 24/7, MLTs work a variety of shifts that can range from 8 to 12 hours. They may work days and/or nights, as well as weekends and holidays. In addition, MLTs may also be on call in case of an emergency. Where Can I Get the Training I Need to Enter This Field? Those interested in pursuing a career in the MLT field need to attain a two-year associates degree from a program at a community college, hospital, trade, or vocational school. Hocking College in Nelsonville, OH offers a Medical Laboratory Technician program in which students can obtain their Associate of Applied Science in Laboratory Sciences in only two years. This program will provide them with the skills they need to collect samples and perform tests to analyze bodily fluids and other substances. Students will also have the opportunity to participate in practicums at local hospital laboratories. Where Can I Find More Information About This Program? Anyone interested in this program can contact the Medical Laboratory Technician program manager, Kimberly Ephlin, by phone at (740) 753-6356 or by email at ephlink@hocking.edu.